Would you like to host Stan’s How to Study Class (after school program) at your school or community organization? We would love to serve families at your school. Let us help. Set up a program in three easy steps. See below. The one-day class is conveniently located at the host school and typically is scheduled from 4:00 p.m. to 7:00 p.m. — we provide snacks for the students. WHO IS THE HOW TO STUDY CLASS FOR? Richard is a “B+” student. Yet his parents and teachers know he can easily be an “A-“ or “A” student. What can Richard do? Stan’s How to Study Class can provide Richard with strategies to improve his study habits, which stands to positively impact his results on school assignments and ultimately improve Richard’s grade point average (GPA). 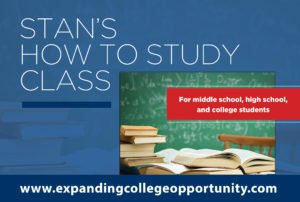 Stan’s How to Study Class will not only help Richard perform well in high school, but also the class will give Richard a competitive advantage by preparing him to meet the increased demands and rigor of college. Tyler is in middle school and is just learning how to study. Her parents recognize the importance of good study skills in order for Tyler to be successful in both middle school and high school. Tyler’s parents want her to go to college. Her parents are willing to invest in Tyler’s education and personal development at an early age because they know it will pay off in the future. Tyler’s mom and dad are spot on. Tyler’s parents know that 50 to 60 percent of a student’s success in school results from strong study skills, not raw intelligence. Stan’s How to Study Class: after school program is generally structured as a parent self-pay program. The average cost per student ranges between $119-$129, which includes the class instruction, program packet, and snacks. The price variation is based on some customization that might be required at different school locations. THREE EASY STEPS TO GET STARTED? STEP 1: Complete our client input form or call us at 404.869.1290. STEP 2: Let us know when you would like to host a class. STEP 3: We will provide you with a flyer about the program for the parents/guardians of your students and a link for parents to register their students online.